With the exponential rise in popularity of nail art, and the demand to create unusual nail looks instantly, we have seen an onslaught of textured polishes surfacing in the beauty world over the last couple of years. One of the biggest (and longest lived) trends has been that matte glitter finish which OPI coined Liquid Sand. I was never that blown away by this particular finish, especially when you can create the same look with glitter polishes you already own and a matte topcoat. 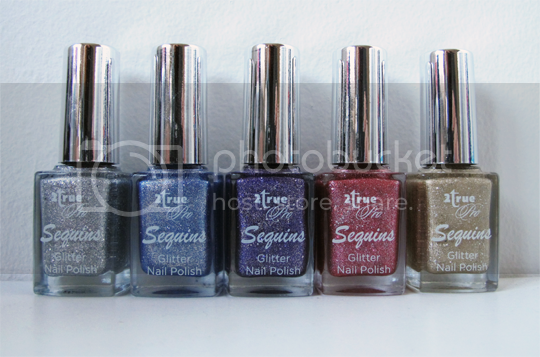 Then, I received these 2True Pro Sequins* nail polishes. I totally wasn’t expecting them to be, but they are that Liquid Sand texture and you know what? I’m actually really liking it! 2True Pro Sequins are all named after 90s supermodels – we have Christy (gold), Eva (blue), Naomi (purple), Elle (pink) and Tyra (gold). When I swatched them on the wheel, I was really surprised to see the sandy matte texture emerge as they dried, and also how quickly they became opaque – two thin coats are all that’s required. You can see that Christy, Naomi, Elle and Tyra all have slightly larger glitters mixed in with the fine coloured particles, whereas Eva is the odd one out without these larger chunks. Ever empathic towards the black sheep, Eva was the one I decided to go for with a full manicure. Generally speaking I’m not a great lover of textured polish, but when I wore Eva I spent a disproportionate amount of time touching my nails with a weird enjoyment for the rough feel. Obviously, if textured polish isn’t your thing at all I would steer clear of these but if you like it, these are fab. Of course, you could add a topcoat for a shiny finish but you’d need at least a couple of layers of it to smooth out the gritty finish. I really quite like them as they are, though! Wear time was nothing to write home about, maybe 3 days before too much unsightly chipping but this could be extended if you decided to go down the topcoat route. For £4 though, I’m not complaining. 2True Pro Sequins are a great way to experiment with the liquid sand polish texture for cheap, so if you’ve not yet had a go with any of the higher end versions yet I’d definitely recommend giving one of these a whirl first to see if you like it. They’re available in Superdrug stores which carry the 2True range. Are you a fan of textured polishes, or do you prefer a classic, shiny block colour?